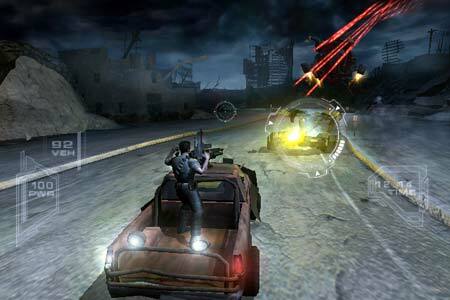 Released by Atari on September 7, 2004, Terminator 3: The Redemption is based on C2 Picture's Terminator 3: Rise of the Machines film and James Cameron's famous Terminator property. I had a chance to preview the PlayStation2 version of this game and have provided you with some information and my thoughts. Fans of The Terminator, rejoice! After several poorly received Terminator video games there, at last, is a game truly capturing the spirit of being the Terminator and worthy of the property! Terminator 3: The Redemption will take you for a thrill ride into the post-apocalyptic universe as you play the series' signature icon, Arnold Schwarzenegger as a T850. Featuring Arnold Schwarzenegger's voice and likeness, Terminator 3: The Redemption will feature high intensity arcade style vehicle combat and character based missions from a third-person perspective. 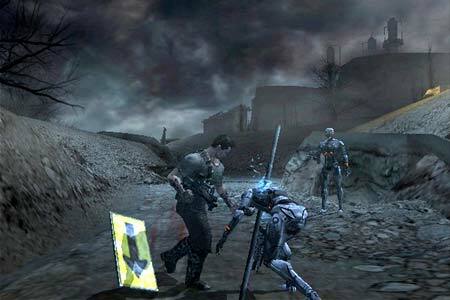 The Redemption is presented in a massive and diverse Terminator world, allowing the player to experience gameplay through three distinct timelines. Dude, look at your skin! You need to use sunblock or something! Jim Galis, Executive Producer at Atari's Paradigm Entertainment says that Terminator 3: The Redemption "will give gamers an opportunity to experience the world of Terminator like never before -- they will go places and do things that have only been hinted at in the films." And I think this adds to the success of this game's player experience. Jim and the Paradigm designers were able to work closely with James Cameron's C2 Pictures to conceive and create elements in the universe that have only been hinted at in the movies. The basic T3 film storyline is used, but expanded in many ways to give you glimpses at uncharted Terminator territory. This includes seeing a future world war in progress and participating in the battles. There is also an alternate future, where the resistance army does not exist. This puts you, playing as Arnold, alone against all of Skynet to fight your way back to the Time Displacement Chamber. Man, it better not rain! 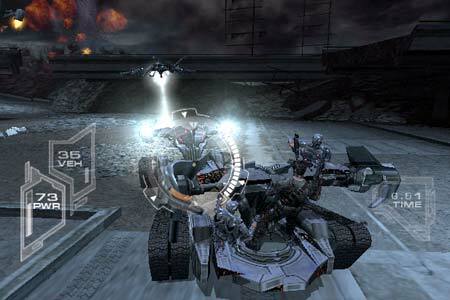 The game features 14 levels in a variety of well-rendered and detailed environments. The one thing I found annoying about some of the levels is how even though they are broken down into several different courses or scenarios, if you die, you have to start over from the very beginning of the level instead of the course you died on. 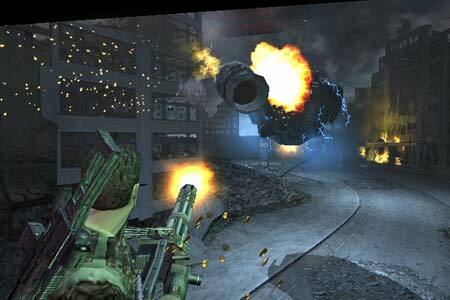 However, each of these levels are explosive and engaging which gives them good replay value. When on foot you are a bit slow and lumbering, but far from helpless since you can engage in classic Terminator combat such as ripping out opposing Terminator's power cells and use them as high-powered explosive devices. 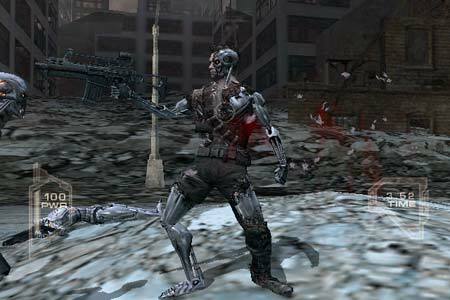 In addition you can use dismantled Endoskeleton torsos as shields, pick-up objects in the environment to pummel and pierce opponents with or simply smash your oppositions to pieces with your choice of different hand-to-hand moves. There are also a variety of guns available throughout the game that you can acquire for taking down targets at a distance. You can even walk around firing two different rifles -- one in each hand! He just fell on it, I swear! But the real adrenaline rush is from the do-not-blink-or-die driving action where you can command any vehicle on the battlefield by leaping from vehicle to vehicle and seizing control of them. When driving, you need to dodge obstacles and shoot opponents who are attacking you from the ground and air. But that's not all, you also have to defend yourself from endoskeletons climbing onto your vehicle. Whether you consider this good or bad, one thing to keep in mind is that this is an arcade style rail game so you can't get completely lost on any of the levels. There is essentially only one course or path to find and then follow. While there isn't much freedom in regard to the storyline, it gives you a better opportunity to focus on each level's primary object or mission, which in most cases requires plenty of dodging and shooting to achieve. A nice little feature that adds dimension to the game play is the ability to upgrade. During gameplay you are given opportunities to earn Terabytes of information which go toward earning combat upgrades. Finally, adding more to this game's experience are the "Terminator Moments" which reward the player with cool only-a-Terminator-could-do action shots for executing risky moves or finding shortcuts. This is a great touch to the game! Also included is a stand-alone co-op game which allows two friends to protect resistance forces on the ground by blasting Skynet opponents from the air. A little too simple in execution, this mini-game unfortunately does not stay compelling for very long. While a huge fan of two-player games, I would have preferred that this co-op feature be excluded and the efforts spent on another game feature or an enhancement for one of the single-player levels. Ultimately, this is still an arcade style rail game, so if you're a player who prefers a free roaming environment like Grand Theft Auto or games with more of a role-playing element like Final Fantasy over single path or predetermined mission ordered games, you may wish to try before you buy, but I think you might be pleasantly surprised. Fans of the Terminator property and even jaded players of arcade style action game will enjoy this game and should do themselves a favor and add Terminator 3: The Redemption to their collection. This game truly captures the spirit of being the Terminator. Hasta la vista, baby! Discuss Terminator® 3: The Redemption in World Famous Comics' General Forum or with your favorite comic book creator at the World Famous Comics Community.